The last time we went to Hong Kong Palace (19101 Colima Road, Rowland Heights) was Christmas, and today Mama Monkey, Brother Monkey, Mr. Monkey, and I went again for one thing: Smurf Houses! 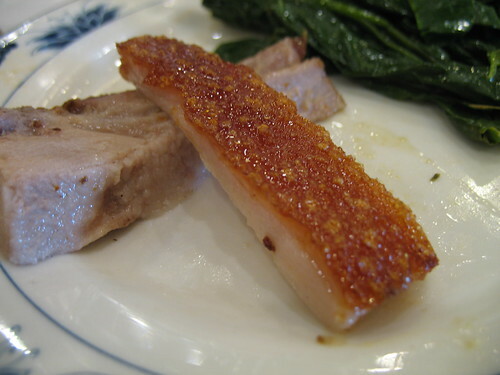 If you are a loyal reader, you know full well that I'm talking about crispy skin almond tea, the most divine hot and sweet treat that modern Chinese cuisine has to offer. Look at it. Beautiful. Golden. Puffy. Flaky. 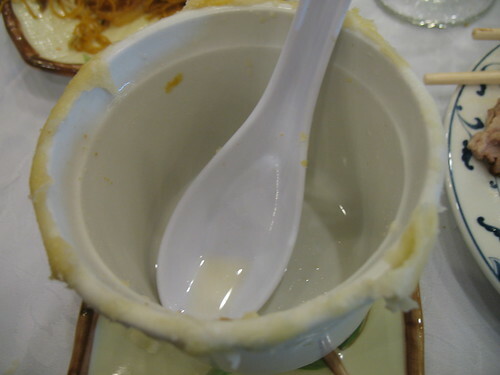 We ate a bunch of other things at dim sum, too. 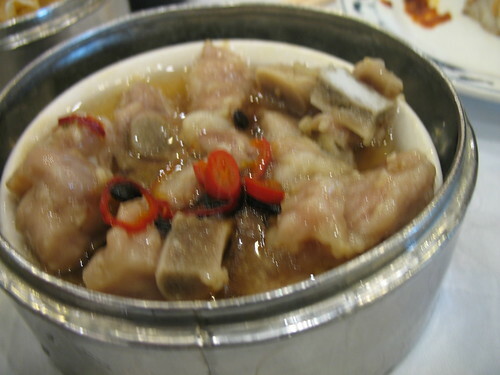 Luo bo gao. 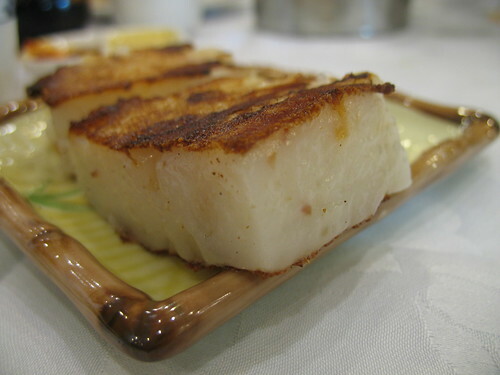 Daikon radish cake. Crispy fried deliciousness. 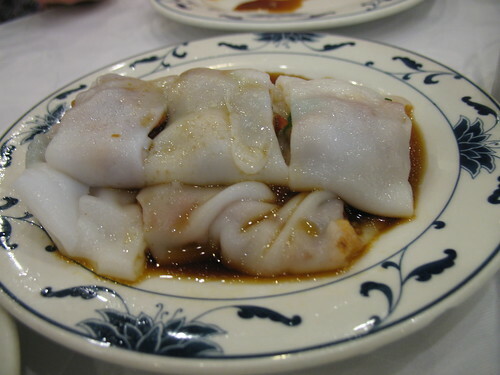 Shao mai. Savory meaty goodness. Pai gu. Little spare ribs that pack a punch. 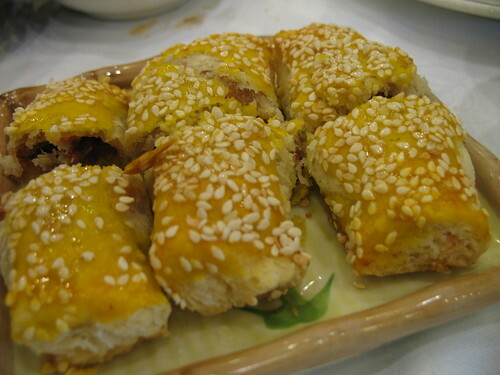 Tofu skin rolls. Good for your tastebuds, good for your health. Xia jiao. A shrimpy favorite. Chang fen. 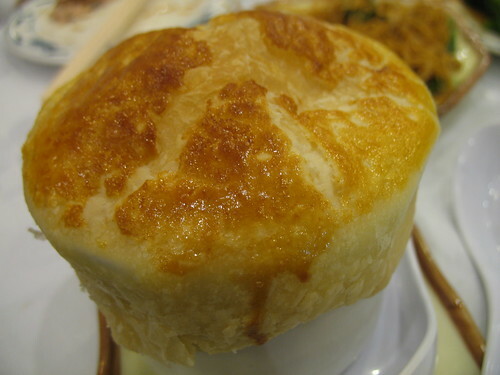 Sweet pork enveloped in a big rice noodle. Mmm. Jie lan. 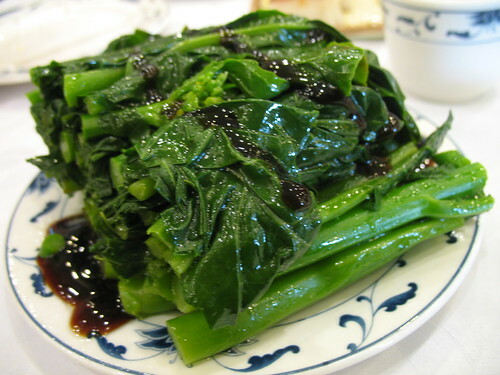 Chinese broccoli drizzled with oyster sauce. Yum. Xian xui jiao. 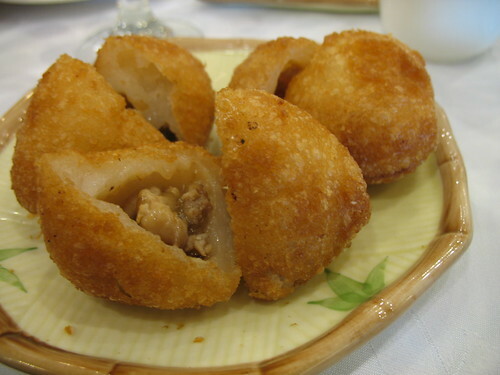 One of my all-time favorites -- fried glutinous dumplings. 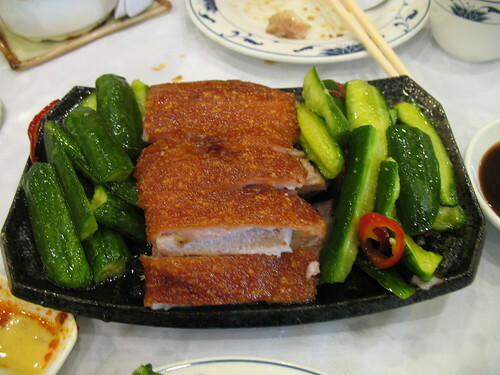 Crispy pork with fresh cucumbers. Grease meets crisp freshness. 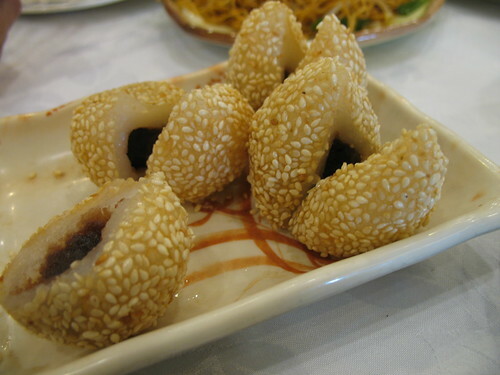 Cai jian bao. Pan fried dumplings infused with leafy greens. 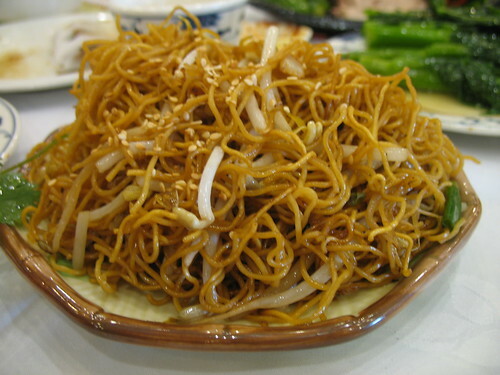 Fried noodles. Oily pasta never tasted so good. Cha shao su. 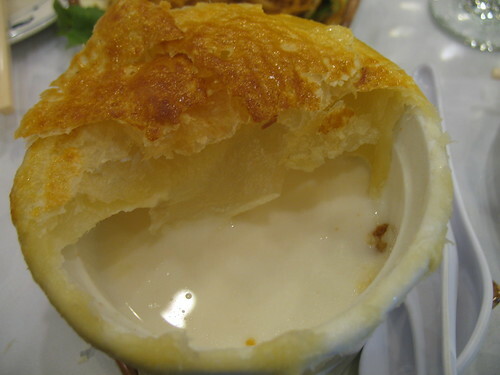 Amazingly flaky and perfect. Ma tuan. Chewy, sweet, and drool-inducing. 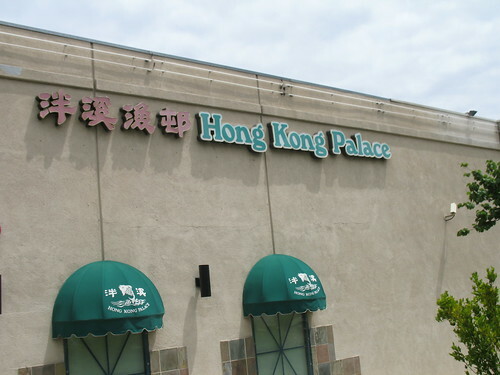 Hong Kong Palace is absolutely packed on the weekends during lunch. 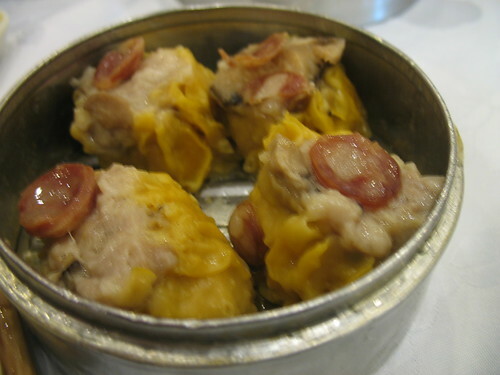 It's no wonder because the restaurant's dim sum is better than dinner. And, while the dim sum is reliable, the star of the show really is the Smurf House, which is the only reason we come here. My advice is to arrive early or to be a total jerk and walk right in and sit down, as we saw several parties do, much to the dismay of all the rest of us who were waiting patiently for our numbers to be called. Lucky for us, when certain jerks tried to swipe our table when our number was up, Brother Monkey blocked them. 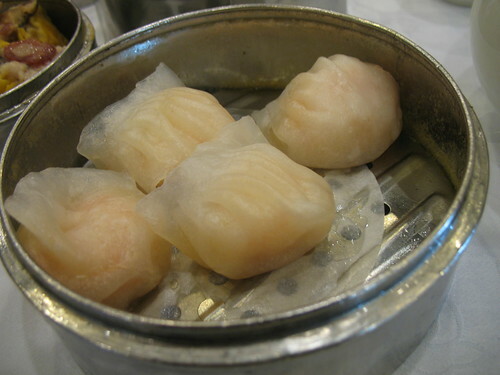 Before I learned of smurf houses we went to dim sum fairly regularly. 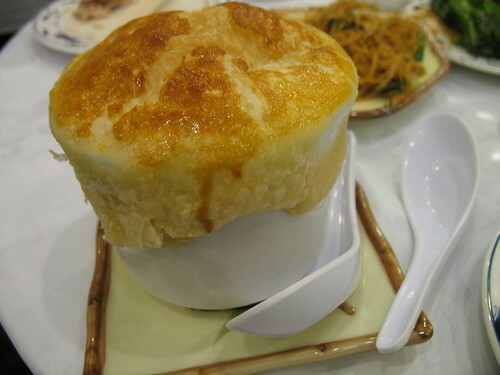 Of course, now that there's something specific I want to try we haven't been to dim sum in AGES! I love fried noodles. I hate jerks. Oooh, I want to go! I need a primer before our trip! Looks absolutely divine! Next time you go dim sum, I wanna come. Those fried noodles looked really good, actually. I've never had dim sum. Take me with you. Please? 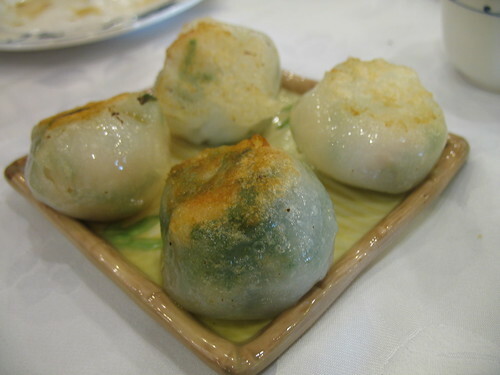 i am absolutely craving dim sum now, and still need to try these elusive smurf houses. yumm!! Yay, I know the names of a few dishes now, no more pointing! That pork and cucumber dish looks yum, I've never seen it. Nice table regulating by BroMo. I'm sure blocking the table, a mean glare, and a stern "what?" would have also been effective. 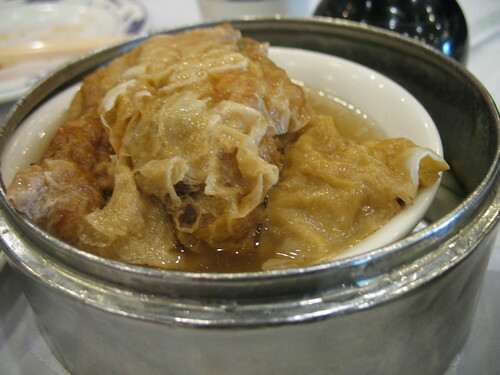 oh man, how i love dim sum. and now i want a smurf house. I've never heard of a smurf house but it looks like something that would satisfy my sweet tooth quite nicely. Your post made me crave dim sum like a muther, btw. Oh man. Seriously mouth watering. I love these pictures of the smurf houses almost as much as the first time I ever saw them.